Please note that, for your convenience, these cells are now provided with QUANTI-Blue™ Solution. 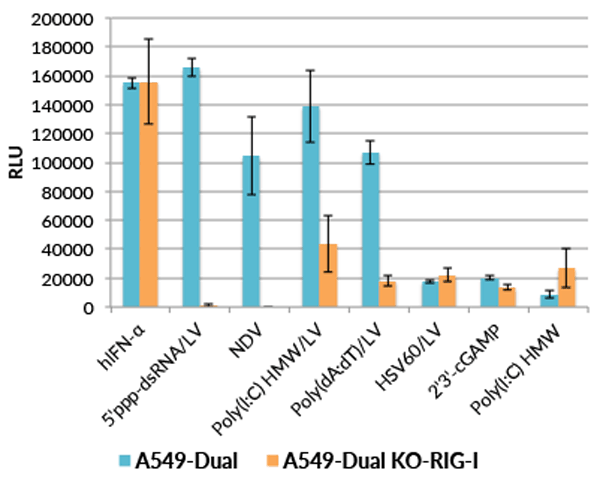 A549-Dual™ KO-RIG-I cells were generated from A549-Dual™ cells through the stable knockout of the RIG-I gene. They are adherent epithelial cells derived from the human A549 lung carcinoma cell line by stable integration of two inducible reporter constructs. The A549 cell line, a cellular model for asthma and respiratory infections, expresses many pattern recognition receptors (PRRs), including RIG-I [1, 2], and the Toll-like receptors (TLRs) TLR2 , TLR3 and TLR5 but not TLR4 . A549-Dual™ KO-RIG-I and A549-Dual™ cells express a secreted embryonic alkaline phosphatase (SEAP) reporter gene under the control of the IFN-β minimal promoter fused to five NF-κB binding sites. They also express the secreted Lucia luciferase reporter gene under the control of an ISG54 minimal promoter in conjunction with five IFN-stimulated response elements. 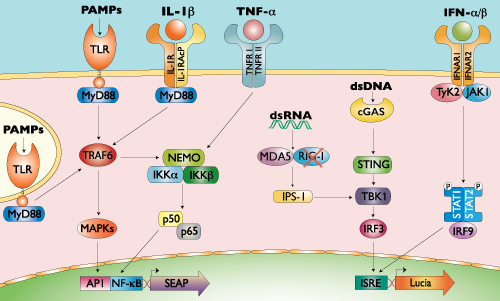 As a result, they allow to simultaneously study the NF-kB pathway, by assessing the activity of SEAP, and the interferon regulatory factor (IRF) pathway, by monitoring the activity of Lucia luciferase. Both reporter proteins are readily measurable in the cell culture supernatant when using QUANTI-Blue™, a SEAP detection reagent, and QUANTI‑Luc™, a Lucia luciferase detection reagent. 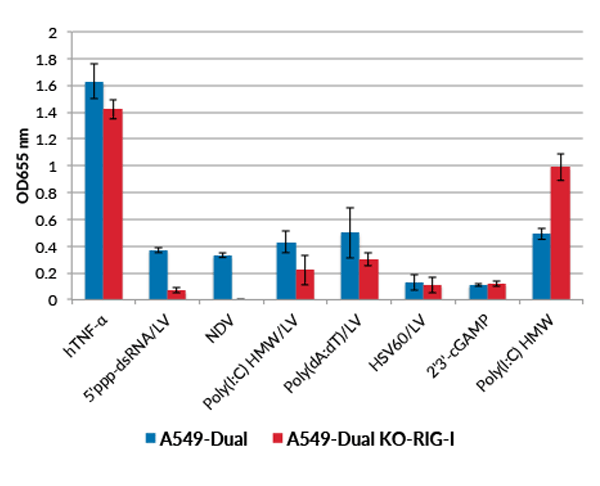 A549-Dual™ KO-RIG-I cells are resistant to blasticidin and Zeocin™. 1. Kolokoltsova OA. et al., 2014. RIG-I enhanced interferon independent apoptosis upon Junin virus infection. PLoS One. 9:e99610. 2. Hagmann CA. et al., 2013. RIG-I detects triphosphorylated RNA of Listeria monocytogenes during infection in non-immune cells. PLoS One. 8:e62872. 3. Slevogt H. et al., 2007. Moraxella catarrhalis is internalized in respiratory epithelial cells by a trigger-like mechanism and initiates a TLR2- and partly NOD1-dependent inflammatory immune response. Cell Microbiol. 9(3):694-707. A549-Dual™ (parental cell line) and A549-Dual™ KO-RIG-I cells were stimulated with hIFN-α (1 x 104 U/ml), 5’ppp-dsRNA /LyoVec™ (1 μg/ml), inactivated NDV (1.86 x 105 U/ml), poly(I:C) HMW/LyoVec™ (100 ng/ml), poly(dA:dT)/LyoVec™ (10 ng/ml), HSV60/LyoVec™ (1 μg/ml), 2’3’-cGAMP (10 μg/ ml) and poly(I:C) HMW (1 μg/ml). After a 24h incubation, IRF activation was determined by measuring the relative light units (RLUs) in a luminometer using QUANTI-Luc™, a Lucia luciferase detection reagent. A549-Dual™ and A549-Dual™ KO-RIG-I cells were incubated with human TNF-α (1 ng/ml), 5’ppp-dsRNA /LyoVec™ (1 μg/ml), NDV (5 x 106 U/ml), poly(I:C) HMW/LyoVec™ (100 ng/ml), poly(dA:dT)/LyoVec™ (1 μg/ml), poly(dA:dT)/LyoVec™ (100 ng/ml), HSV60/LyoVec™ (1 μg/ml), 2’3’-cGAMP (10 μg/ml) and poly(I:C) HMW (1 μg/ml). After a 24h incubation, NF-kB activation was determined using QUANTI-Blue™, a SEAP detection reagent, and by reading the optical density (OD) at 655 nm. RIG-I knockout has been verified by functional assays and DNA sequencing. A549-Dual™ KO-RIG-I cells are guaranteed mycoplasma-free. RIG-I (retinoic-acid-inducible protein 1, also known as Ddx58) is a cytoplasmic RNA helicase that is critical for host antiviral responses. It senses double-stranded RNA (dsRNA), a replication intermediate for RNA viruses, leading to production of type I interferons (IFNs). Notably, it binds specifically to short dsRNAs that have blunt ends and a 5′ triphosphate (5′-ppp) moiety, facilitating discrimination between host and viral dsRNA. RIG-I and the related RNA helicase MDA-5 recognize a complementary set of cytosolic viral dsRNA. Interestingly, transfected poly(I:C), a synthetic analog of viral dsRNA, is recognized by both RIG-I and MDA-5. Dual-functional peptide with defective interfering genes effectively protects mice against avian and seasonal influenza.